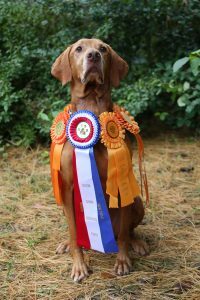 We also get Vizslas from kill shelters, where they have ended up because they were lost, and from puppy mills, where uncaring owners have used the dogs as breeding machines and don’t need them any more. Some dogs who have been prisoners of puppy mills turn out to be the most loving and affectionate dogs we see; it’s as if they know they have left their miserable pasts behind forever. This is not to say that all of our rescue dogs come to you with perfect manners and are perfectly socialized and housebroken. Dogs who have been neglected and abandoned need training and gentle discipline to become good canine citizens. But so do the puppies people buy! And a rescue dog usually needs much less training than a pup. 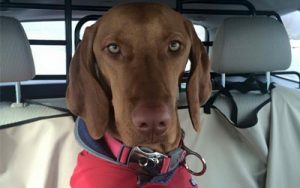 Generally, NHVR vizslas spend time in a foster home, with an experienced vizsla owner, before they are placed in an adoptive home. During that time, they are evaluated (in terms of their personalities-how well they deal with other dogs, with children, and so on) and trained (housebroken, socialized) if necessary. For the most part, our adoption fees reflect the medical expenses incurred for a particular dog. Our rescuers sometimes add a small amount for the NHVR medical fund, which helps pay the medical bills for dogs that require unusually expensive care — bills that an adoption fee could not cover. Please keep this fact in mind: The adoption fee for a NHVR rescue dog is usually somewhere between $100 and $300. The going rate for a puppy at a pet store–a puppy that, in all likelihood, came from a puppy mill–is anywhere from $500 to $1500. And you still have to pay for vaccinations and spaying or neutering on top of that. Rescue dogs are sometimes a bargain! 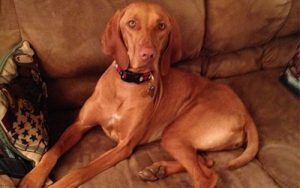 www.vcaweb.org/breed/why_a_vizsla.shtml. Vizsla Club of America (VCA) Why a Vizsla? A great big “THANK YOU” to Almost Home Dachshund Rescue Society. for the contents of this page!